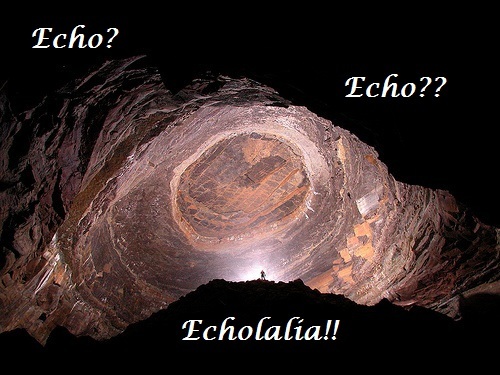 After checking out ASHA’s Compendium of EBP Systematic Reviews and Guidelines for Autism, I quickly realized searching for “Echolalia” was not the way to search for echolalia. My interest in echolalia and autism comes from my graduate clinical hours. So far, 45 of my 55 hours of clinical work is in autism – verbal, non-verbal, and echolalia. While I am by no means an expert, I can fully say that if I had a client milder or more severe forms of autism – I am confident I can handle it. Autism and Alternative communications have become my passion; so I have spent numerous hours/days/months collecting information about Echolalia and Autism Therapy types. Goldstein, H. (2002). Communication intervention for children with autism: A review of treatment efficacy. Journal of Autism and Developmental Disorders, 32(5), 373-396. McMorrow, M. J., Foxx, R. M., Faw, G. D., & Bittle, R. G. (1987). Cues-pause-point language training: Teaching echolalics functional use of their verbal labeling repertoires. Journal of Applied Behavior Analysis, 20, 11–22. McGahan L. Behavioural interventions for preschool children with autism. Ottawa: Canadian Coordinating Office for Health Technology Assessment; 2001. Technology report no 18. Sally J. Rogers and Laurie A. Vismara. (2008) Evidence-Based Comprehensive Treatments for Early Autism. Journal of Clinical Child and Adolescent Psychology, 37(1), 8-38. National Initiative for Autism: Screening and Assessment (2002). National Autism Plan for Children (NAPC). Susan Stokes (2012). Developing an Intervention Program for the Verbal Child with Autism. ***The website holds a treatment plan for echolalia. CAUTION!! Use with caution because there are no references. However, great insight into some of the tendencies and environmental arrangements needed to reduce echolalia behavior. Watson, L. R. & Flippin, M. (2008, May 27). Language Outcomes for Young Children with Autism Spectrum Disorders. The ASHA Leader. Kasari, C., Freeman, S., & Paparella, T. (2006). Joint attention and symbolic play in young children with autism: a randomized controlled intervention study. Journal of Child Psychology & Psychiatry, 47(6), 611–620. Yoder, P. & Stone, W. L. (2006b). Randomized comparison of two communication interventions for preschoolers with autism spectrum disorders. Journal of Consulting and Clinical Psychology, 74, 426–435. Feuerstein, R., Miller, R., Hoffman, M., Rand, Y, Minsker, Morgens, Jensen, (1981) Cognitive modifiability in adolescence: cognitive structure and the effects of intervention. Journal of special education, 150, 269-287. Feuerstein, Rand, Hoffman, Hoffman, Miller (1979) Cognitive modifiability in retarded adolescents: effects of instrumental enrichment. American Journal of Mental Deficiency, 83, 539-550. Harris, S. L. (1975). Teaching language to non-verbal children with an emphasis on problems of generalization. Psychological Bulletin, 82, 565-58. Dyer, K. (1989). The effects of preference on spontaneous verbal requests in individuals with autism. Journal of the Association for Persons with Severe Handicaps, 14, 184–189. Siller M. & Sigman, M. (2002). The behaviors of parents of children with autism predict the subsequent development of their children’s communication. Journal of Autism and Developmental Disorders, 32, 77-89. Hancock, T. B., & Kaiser, A. P. (2002). The effects of trainer implemented enhanced milieu teaching on the social communication of children with autism. Topics in Early Childhood Special Education, 22, 39–54. Kaiser, A.P., Hancock, T.B., & Nietfeld, J.P. (2000) The effects of parent-implemented enhanced milieu teaching on the social communication of children who have autism. Early Education and Development, 11(4), 423-446. Concroy, M., Haydon, T., & Mancil, G. R. (2009). Effects of a modified Milieu therapy intervention on the social communicative behaviors of young children with autism spectrum disorders. Journal of Autism & Developmental Disorders, 39, 149-163. Warren, S. F., & Gazdag, G. (1990). Facilitating early language development with milieu intervention procedures. Journal of Early Intervention, 14(1), 62–86.